Last week Burnaby Mountain’s 14th Pathfinders had their year end camp at Manning Park. Gold Camp is the grand finale of Pathfinder program and allows third year girls to take on tremendous leadership in planning their own camping adventure. It’s great to see the Pathfinders continuing their programming even into July, after many groups have stopped for the year. Guider Marie is never one to let good camping opportunities slip away and nothing is better on a beautiful summer weekend than camping with your Guiding friends in a great BC park. This Gold Camp was planned by three third year girls who each was responsible for her own site of two or three younger girls (Guides and Pathfinders) and got to host leaders at mealtimes. 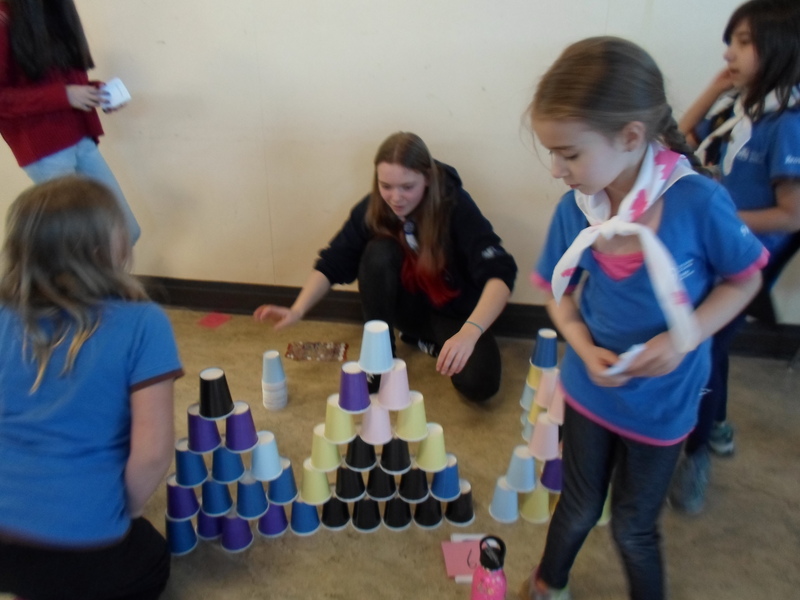 It gives the girls a great chance to experience the work that goes into planning the meals, activities, and safety considerations involved in executing an awesome camp in Girl Guides. It’s a lot of responsibility to be in charge of what’s happening, especially when you have younger and less experienced campers in your care. The site was Coldspring Campground at EC Manning Provincial Park. It is a beautiful spot with lots of great nature and wildlife to enjoy. It was fun seeing the many marmots popping up to say hello! A particular highlight of the trip was spending a couple of hours canoeing and kayaking on Lightning Lake. It was a beautiful day to be out on the water. Other activities included field games like capture the flag, and a “campfire” that was hardly hampered by the campfire ban — the girls still sang their favourite songs and even roasted s’mores using their propane camp stoves. For the Guides who were invited as guests to this camp, it was a great chance to see what kinds of fun await in Pathfinders. Guiding is all about celebrating both old and new friendships. Well done, third years, for hosting such an awesome Gold Camp! Completing the Pathfinder program is a lot of work, but in the meantime you’ve all gained excellent skills, not to mention the fun, friendship, and memories! Sometimes it is fun to catch up with one of our units during a “normal” meeting — that is, something that isn’t a special event like an outing, sleepover, or camp. At our regular weekly meetings, girls participate in all kinds of fun, hands-on programming. 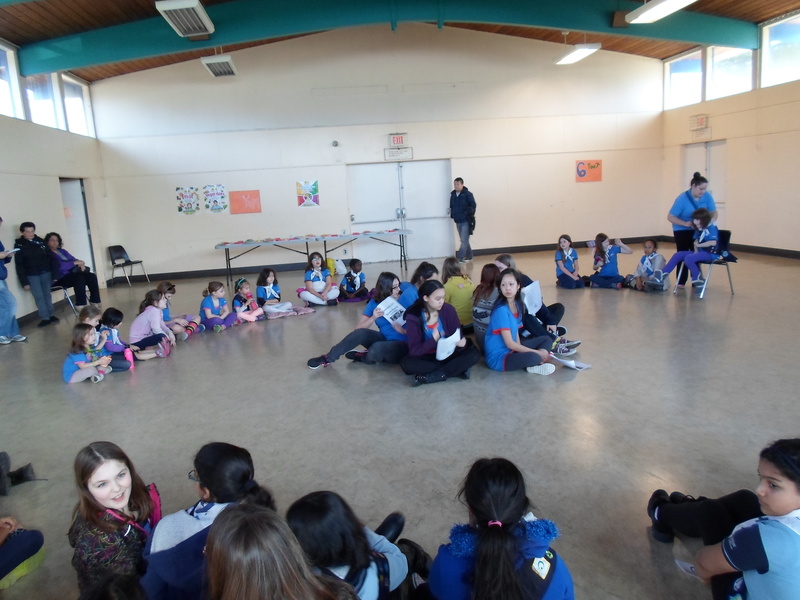 Recently, the 54th Burnaby Mountain Brownies had a meeting about flags and heritage. Jenn, one of the group’s leaders, describes the meeting below. Tonight we worked on our Key to My Community which involved a flag ceremony and learning about Canada! Our circle leaders got to be in charge of the flags. We learned how to hold a flag, we learned they never touch the ground and we learned how to carefully roll our flags back up for storage. They loved seeing them (and do did I! We have a district flag? COOL) and learning about them all. We also played a little basketball free throw tonight and learned a bit about the Canadian guy who invented it! Before we played, we had a lacrosse stick and a hockey stick and asked which one is our national sport? They all chose Hockey! Which is actually just the sport we are the best at, not our national sport. It was a good meeting and I know we sent home some tired Brownies tonight! 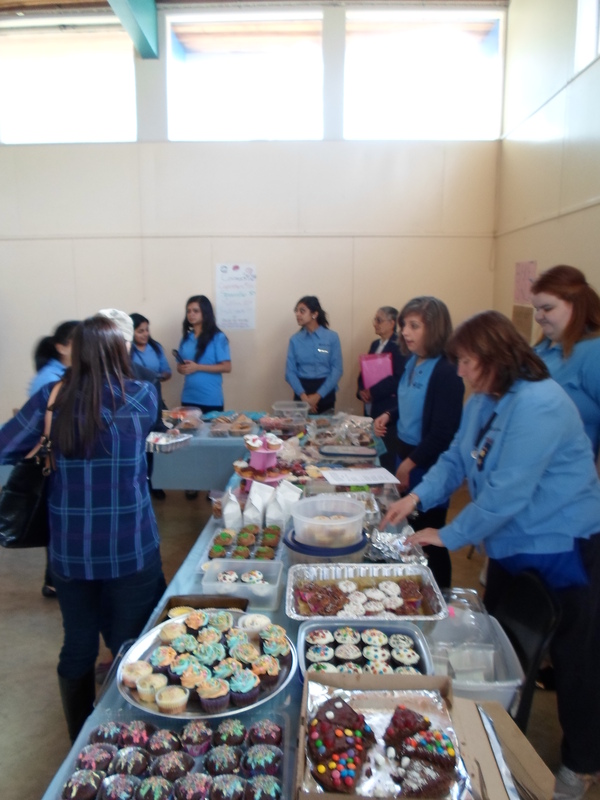 Thank you, Jenn, for sharing about your Brownie meeting. It sounds like the girls were really engaged and had a great time doing this GGC programming. One of the most popular program areas with our girls is STEM — Science, Technology, Engineering, and Math. Getting the chance to explore these fascinating disciplines with hands-on activities in a really fun and girl-centred environment is a real a treat. 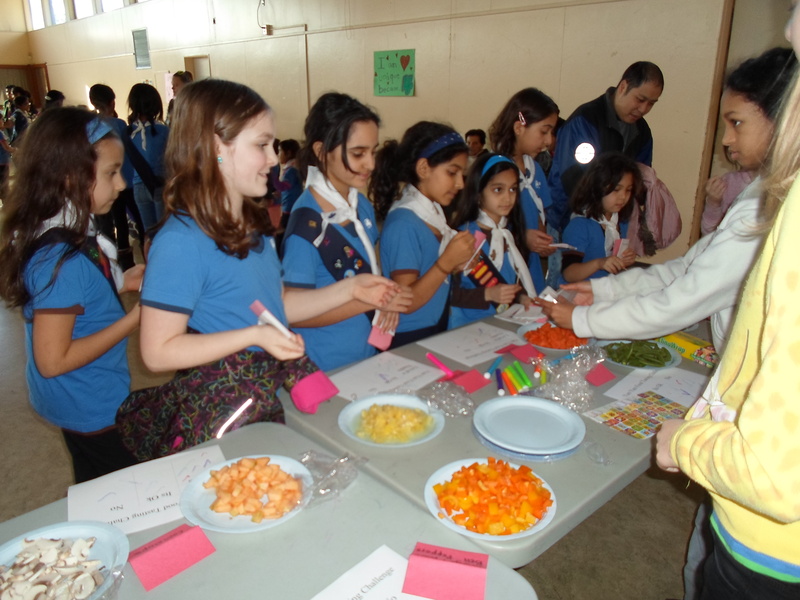 This year, the 54th Brownies have been going crazy with STEM. The girls just can’t get enough. Back in January, the unit had a blast at the West Coast Area Science World Sleepover. They have also spent a bunch of time over a selection of meetings this winter and spring, exploring STEM topics to earn their Provincial STEM challenge crests. Check out these images from some of those meetings. Some of the activities that they have tried include discovering ways to check whether an egg is raw or hard boiled, making music with water in stemware, studying fizzy water vs regular water under black light and then making their own Sparkling lemonade! Yum!! They have also learned about cyber safety, taken cellphones apart to get a look at the inside and made their own computers. And exploring engineering has given them the chance to build tall towers and to design shelters to keep their favourite stuffed critters safe from the elements. Believe it or not, they’re not done yet! The 54th Brownies look forward to joining all the rest of the Burnaby Mountain girls at our next big district event: Science Day at SFU! At the end of April, girls of all branches will get a chance to explore science in real science labs with real science students. As you can imagine, these girls in particular are really excited about it! 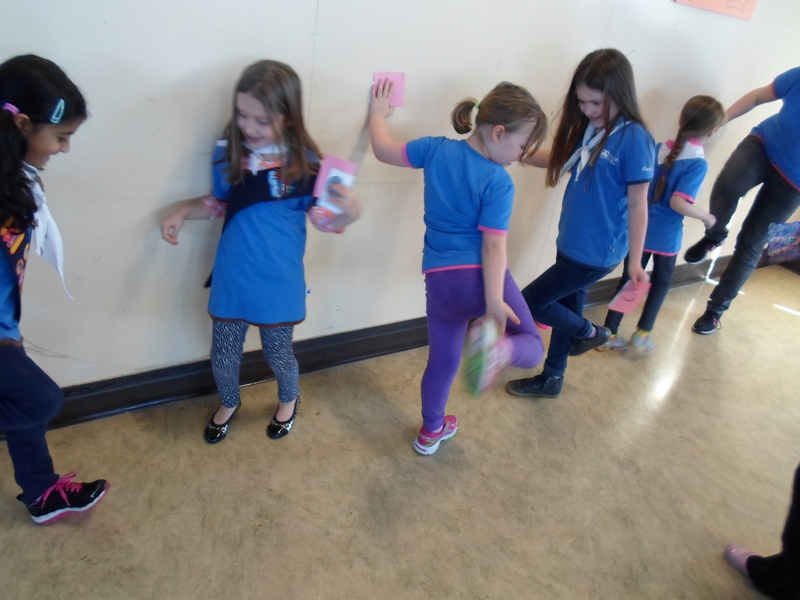 A recent regular meeting of the 54th Brownies was made even more exciting than normal with a visit by a guest speaker from an organization called Species at Risk. The speaker came in to discuss identification of local species and distinctions between native and invasive species, threats to survival, habitat needs and the actions being done to help. 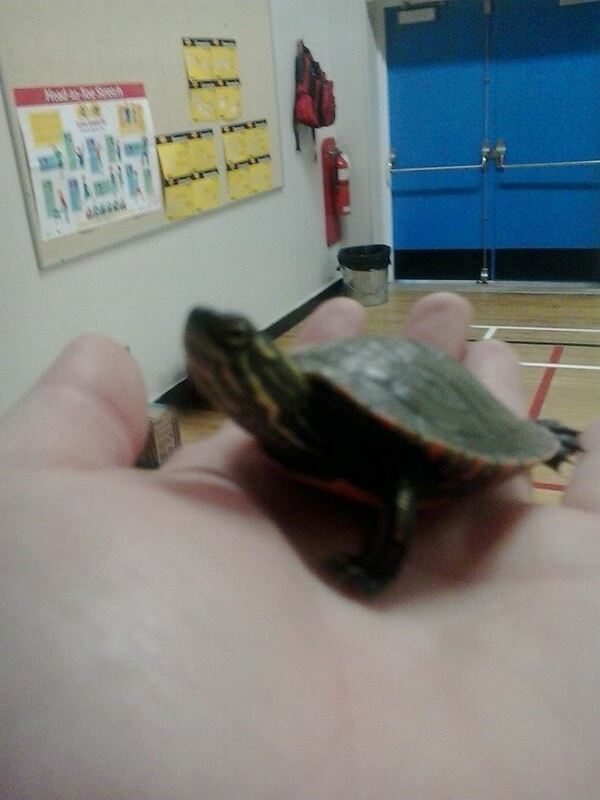 She also brought in “ambassador animals” — two juvenile painted tutles named Bert and Ernie that the girls got to handle. This presenation worked towards the unit’s program activities about the living world, particularly their “Saving our Plants and Animals” badge. Thank you to Andrea (and Bert and Ernie!) for such an informative presentation. The girls learned a lot.